Another Mariah-inspired mishap. Stephen Colbert hilariously parodied Mariah Carey’s disastrous New Year’s Eve performance on The Late Show With Stephen Colbert on Tuesday, January 3. Watch it in the clip above! Colbert then mocked the pop star’s onstage confusion, which was broadcast live around the world. “This was not her fault. Mariah, you’re welcome to come on my show any time. … I’m sorry, there’s nothing in my prompter here,” he said. Suddenly several dancers popped up around him while he yelled, “Is this getting fixed?” The dancers tried to distract from the debacle with giant feathers. “I’m sorry … Is this … I was not informed. Am I supposed to be singing right now?” Colbert quipped. 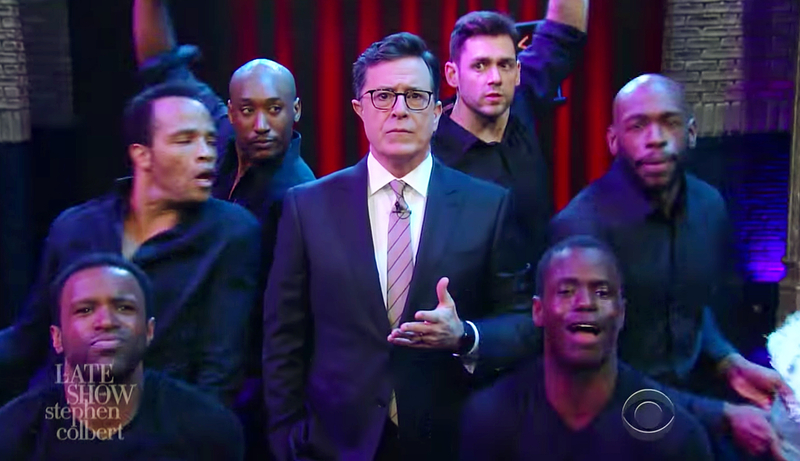 At the very end of the clip, one of the dancers attempted to pick up the late-night host, poking fun at the moment when Carey asked a male dancer to flip her around. The Mariah’s World star later told Entertainment Weekly that she was “mortified” by the incident. “It’s not going to stop me from doing a live event in the future,” she said. “But it will make me less trusting of using anyone outside of my own team."